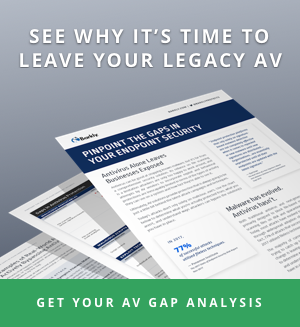 With another year nearly in the books it's time to step back, look around, and see where things stand at your organization in terms of security. What improvements have you made? What's still on your to-do list? What do you know now you didn't know a year ago? What do you now know you don't know? What can you prioritize learning heading into 2017? Don't get too discouraged if you're not feeling too confident, or if you find you have more questions than answers. According to a recent survey of 700 security practitioners, the average organization is less confident in its security posture than it was this time last year. On average, security practitioners gave their organizations a grade of C- in cybersecurity. The top three reasons for the drop in confidence? Whether you’re new to security or a seasoned pro, chances are you find at least one of these things challenging. After all, new threats are constantly emerging. The workplace and work habits are rapidly evolving, too. As a result, priorities are shifting all the time. There’s a lot to be distracted by and it’s easy to feel like you’re perpetually playing from behind. If you're like the majority of practitioners, security isn't the only thing on your plate. To help you make the best use of your limited time we've teamed up with security tactician Pete Herzog to create The Open Source Cybersecurity Playbook, a complete, customizable IT security plan for protecting your organization against cyber attacks and data theft. We designed the Playbook to provide IT pros with a practical, step-by-step framework designed for generating quick wins as well as long-term, sustainable progress. That means no fluffy or unrealistic best pratices. Just actionable tips and real-world tactics you can start putting to use now. Thanks in part to Pete's persistence (of which he has loads), we also decided it was important to make the Playbook available to anyone with as little barriers as possible. That's why we're publishing it un-gated (no email address required!) and making it open source. Ready to check the Playbook out for yourself? Download it here. Scouting Reports: Profiles for the most common security threats you need to be prepared to face. Your Game Plan: A list of real-world tactics for good, strong security. Looking Downfield: Tips for setting yourself up for success both now and in the long run as threats evolve. Pete is up to all sorts of interesting security research, and he provides a variety of security training, seminars, and certification, too. Learn more at www.isecom.org. Thanks in advance for checking out the Playbook. We hope you find it useful and would love to get your thoughts on how we can make it even better. Send any questions or feedback to jonathan dot crowe at barkly.com.